DreamWorks Animation has acquired the film rights to the Good Luck Troll toys from Dam Things in Denmark, and plans to produce a feature film based on the popular figures. The Good Luck Troll dolls were created in 1959 by Danish woodcutter Thomas Dam. The dolls caught on and became a craze in the 1960s and again in the 1990s. “My father would have been very happy to know that his Troll has found its dream partner in DreamWorks Animation,” said Niels Dam, who now owns the family business. What was the earliest year that you sold Troll Dolls in the USA? I got mine as a birthday present in September of 1962, at least that's what I remember. 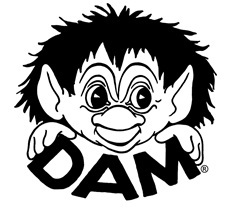 I have 2 Dam trolls 1985 unfortunately I have lost the outfit for one. I can't find any like i; do you do replacement ? Can new Dam troll dolls still be purchased? From this site or another? Any help would be much appreciated. Thank you! Can I purchase just the hair from you? Jeg har en lille keramik Dam Trold fra 1967. Den har to minimale afslag på hatteskyggen. Den er mærket i bunden DAM 67 (c). Jeg vil gerne vide, hvad den er værd. Hello I had a troll like the Blue one pictured above. It was stolen. I would like to buy another. Is that possible?I wish to buy a new one. Hi! An original troll from 1965 what would it be worth? Its a very small one.